Complex Carbs - Are They Healthy? 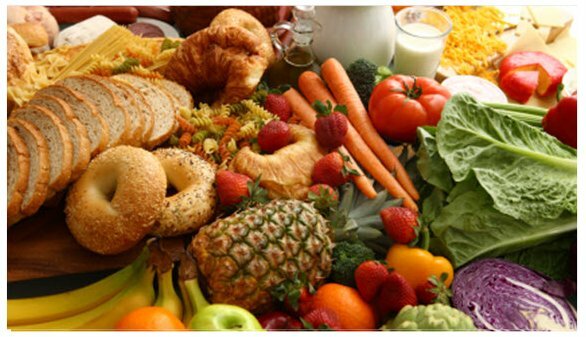 Most American mainstream medical and nutrition agencies tell citizens that complex carbs (meaning whole grains, fruits and starchy vegetables) are an important part of the diet, and that these "good carbs" are the healthiest foods to eat. But is that true? Health can be logically defined as the absence of disease or the markers of disease. For most people, good heart health translates into a low LDL cholesterol, high HDL cholesterol, low triglycerides and low inflammation as measured by c-reactive protein levels. For a person with diabetes, good health can be measured with the metabolic indices of a fasting blood sugar below 110, and a hemoglobin A1c (HbA1c) of less than 5.4. And since it's well known that diabetics with uncontrolled blood sugar often die of heart disease, we can safely say that the markers for heart health are highly correlated with blood sugar health. In the conclusion of this study, the authors wrote that "In addition to vascular disease, diabetes is associated with substantial premature death from several cancers, infectious diseases, external causes, intentional self-harm, and degenerative disorders, independent of several major risk factors." 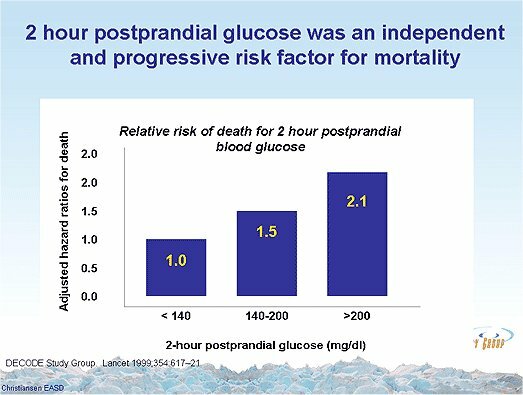 Here's another study which correlates high blood sugar with a higher risk of mortality. So, now that we have established that maintaining normal blood sugar levels is a critical marker for overall good health, it follows that the foods which help you maintain healthy blood sugar levels are the healthiest to eat. You would expect that since the American Academy of Nutrition and Dietetics, the American Diabetes Association, and other mainstream medical organizations say that complex carbs are healthy, it must mean that eating complex carbs helps you achieve the cardiovascular and metabolic markers for good health. In layman's terms, eating these foods should have the effect of better heart health and normal blood sugar levels. But when we actually look at the results of eating many complex carbs, the results aren't so healthy. It's generally recognized by most physicians who treat diabetics that for a person weighing 150 pounds, eating 1 gram of carbohydrate will raise blood sugar 5 mg/dl. We'll use this "normal" measure as our base. Normal fasting blood sugar ranges from 70 mg/dl to 99 mg/dl. Some insist that the upper cutoff number for healthy fasting blood sugar is 83 mg/dl. Let's assume we are starting with a baseline blood sugar of 85 mg/dl. Complex Carbohydrate Food Net Carb grams per serving Possible post-prandial blood sugar (carb grams x 5) added to baseline of 85 Below 120 mg at 1 hour? As you can see, many of the recommended complex carbs (whole grains, starchy vegetables) really spike blood sugar. The healthy ones all fall into the category of non-starchy, fibrous vegetables. Here's another chart of foods for you to compare with the results in the chart above. You can see that the foods which mainstream medical and nutrition associations tell you to avoid (ie. meat, full fat dairy, eggs, saturated fats) have very little effect on blood sugar. Food Net Carb grams per serving Possible post-prandial blood sugar (1 gram = 5 mg/dl rise) added to baseline of 85 Below 120 mg at 1 hour? The numbers above are possible results given our general blood sugar rules. Individual results will vary greatly. Get a baseline blood sugar reading before you eat. Choose one of the complex carb foods from the list, and eat only that. Record your blood sugar numbers at 1 hour and 2 hours after you eat. Highlight the readings that go over 120 mg/dl. Keep a log over a two-four week period of testing. At the end of the list, you'll know exactly how each complex carb on the list affects your blood sugar levels, and in turn, your health. My guess is that you will discover that many foods which fall under the "healthy complex carbs" category aren't so healthy in terms of blood sugar maintenance, and hence, aren't so healthy to eat in general. And just to pound another nail into the "complex carbs are good for you" coffin, check out this post on another China study which revealed that a higher fruit and vegetable intake is associated with higher rates of obesity.